Growing up, my mom often made these light fluffy pancakes that she called Baby Germans. It wasn’t until I was an adult that I wondered if that was the real name. It seemed odd that a food would be called “Baby Germans”. 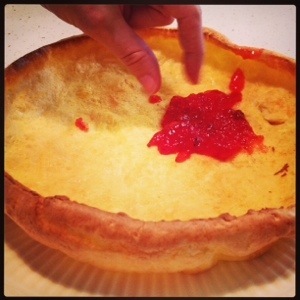 After another exhaustive internet research, I learned that these are usually called “Dutch Babies” or “German Pancakes”. My mom just combined the two for interest, to mix things up. No matter what you call them, these light fluffy pancakes are easy to made and a delicious reservoir for any and all of Aunt Becky’s special jams. If you’re making them for a large group, you can mix up the batter and use smaller oven-safe pans. My sister uses a variety of shapes and sizes at once so my nieces can devour them at the same time.